1. Tom rolled out the red carpet for his girlfriend on her birthday. He bought her a beautiful necklace and made her a Thai curry with fresh spices. 2. When the new clients come next week let's roll out the red carpet. Why not take them to that amazing five-star French restaurant? 1. If you make a mistake don't just sweep it under the carpet. It's always better to admit it. 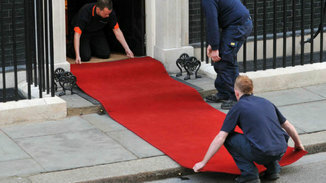 Red carpets were traditionally used for welcoming royalty and heads of state, though these days they are often used for celebrity events. The earliest reference to a 'red carpet' in this sense was is in a play by the Greek dramatist Aeschylus in 458 BC.